São Miguel Island, named for the Archangel Michael (Portuguese: São Miguel), is also referred to locally as "The Green Island", is the largest and most populous island in the Portuguese archipelago of the Azores. The island has around 138,000 inhabitants and its largest city, and in the archipelago, is Ponta Delgada. In 1427, São Miguel became the second of the islands discovered by Gonçalo Velho Cabral to be settled by people from continental Portugal. The first capital of the island was Vila Franca do Campo, which was devastated by a major earthquake and landslides in 1522. The tragedy helped to elevate Ponta Delgada to the administrative and economic status of capital and business centre from 1546. With the Portuguese Restoration War (1640), the island became a commercial centre, establishing new contacts in Brazil. Some of the island’s historic buildings, including mansions and churches, date from this period; the island's development came from revenues from the export of oranges, mainly to Great Britain. The period after the Liberal Wars allowed the economy to flourish, and the port of Ponta Delgada expanded, through the export of new crops such as tea, pineapple, and tobacco. The development of the fishing industry, cultivation of staple food and expansion of the dairy industry permitted the growth of many of the towns on the island. The São Miguel Island has an area of 744.57 km2 (287.48 sq mi). It is a narrow island; it is 63.54 km (39.48 mi) long (from southeast to northwest) and 15.63 km (9.71 mi) wide (from southwest to northeast). The island, of volcanic nature and subject to seismic activity, presents many mountains, mainly in the interior, dominated by the Pico da Vara; those mountains are cut by valleys, gullies and streams - the only waterways because there are not rivers. The island consists of an ancient massif in the eastern end, and three stratovolcanoes: Sete Cidades, Fogo and Furnas. The stratovolcano of Sete Cidades is known for its large caldera (Portuguese: caldeira) of 5 km (3.1 mi) in diameter and 350 m (1,150 ft) of mean depth; in it there are two small lakes (Lagoa Verde to the south and Lagoa Azul to north). In the eastern part of the island is the Pico da Vara (37°48′36″N 25°12′36″W﻿ / ﻿37.81000°N 25.21000°W﻿ / 37.81000; -25.21000﻿ (Pico da Vara)) - the highest mountain of the island - with 1,103 metres (3,619 ft) of altitude. In the central area, is the Sierra de Água de Pau with 940 m height and on the west lies the Caldeira das Sete Cidades, 850 m altitude. Lying at the eastern end of the island, Pico da Vara is the focus of a Special Protection Area containing the largest remaining laurisilva forest on the island, which is home to the endemic and critically endangered bird, the Azores Bullfinch. Its fertile lands produce cereals, tea, grapes (for wine), fruits and food for cattle. Similar to other islands in the Azores archipelago, São Miguel is influenced by ocean currents and winds, in particular, the Gulf Stream. It functions as a moderating force in the islands, keeping temperatures hovering between 14 and 26 °C (57 and 79 °F) throughout the year. Rainfall is distributed evenly throughout the year, although it is most abundant in the cool season. The island's location also makes it susceptible to many Atlantic storms. The Köppen climate classification subtype for the climate of Sâo Miguel Island, in Ponta Delgada, is Csb (Mediterranean Climate). Most towns and cities are in plains, some along the coast and a few in the interior of the island. 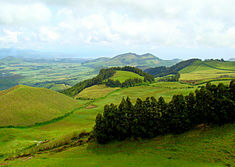 There are several communities within ancient craters (such as Sete Cidades, Furnas or Povoação), river valleys (such as Ribeira Chã, Pilar da Bretanha) or coastal deltas (Mosteiros). There are two cities in the islands: Ponta Delgada and Ribeira Grande. Lagoa 14,442 45.6 316.7 The youngest of the municipalities of São Miguel. Nordeste 4,937 101.5 48.6 Well known for an abundance of natural vegetation and the highest point on the island, Pico da Vara. Ponta Delgada 68,809 233.0 295.3 It includes not only the industrial/commercial city of Ponta Delgada, but also many rural parishes, as well as the large crater of Sete Cidades. Ribeira Grande 32,112 180.2 178.2 The second largest municipality, created in 1981, and has an extensive area of the northern coast. Vila Franca do Campo 11,229 78.0 144.0 Once the seat of the historical capital of São Miguel (until it was almost destroyed by earthquake and landslides in 1522), it is located along the southern coast between Lagoa and Povoação. Center of Ponta Delgada, from the marina complex, Portas do Mar. Stairs of the Ermida de Nossa Senhora da Paz in Vila Franca do Campo. Southeastern coast of São Miguel with the landscape of the Povoação caldera. ↑ "CAOP 2013". Carta Administrativa Oficial de Portugal. Direçâo-Geral do Território. 16 September 2013. Retrieved 20 September 2013. ↑ 2.0 2.1 "Census 2011" (xls). Serviço Regional de Estatística dos Açores - Statistics Azores. Retrieved 21 September 2013. ↑ "Pica da Vara, Portugal". Peakbagger.com. Retrieved 18 August 2017. ↑ "Ponta Delgada, Portugal". Weatherbase. Retrieved 20 September 2013. ↑ "World Map of Köppen-Geiger Climate Classification". Retrieved 20 September 2013. ↑ "Estatísticas territoriais". Statistics Portugal. 10 December 2012. Retrieved 21 September 2013. Wikimedia Commons has media related to Island of São Miguel (Azores). This page was last changed on 18 August 2017, at 13:41.